Dave, Karl, bananas, aye aye aye! I LOVE minions. …And it turns out that there is no shortage of little humans after minion cakes, either! I have seen some really fabulous minion cakes around the traps. This one by Caroline Nagorcka is without a doubt the most amazing and creative one I have seen to date… but with the new Minions movie set for release next year, I am expecting to see a whole new surge of fun and creative minion cakes – I can’t wait! Now that I have set the bar exceedingly high, I will lower it slightly with my own minion creations! First up, I have a minion “head” cake and some matching cupcakes! These were for my friend Katie who actually makes cakes herself (her Facebook page is Dessert Island) so the pressure was on! Just joking… I know Katie appreciates the difficulty of caking more than anybody else, since she does it herself! I wanted the yellow to be REALLY minion yellow so I bought pre-coloured Satin Ice. As much as I love the vibrancy of the colours it really is so much softer to work with than lighter coloured icing or icing coloured yourself. A little extra challenge! I also didn’t really factor in enough icing when I bought it so I had to roll it much thinner than I would have liked, given how soft it was! I was so worried about the edges tearing… but alas, it made it! Katie just requested buttercream cupcakes but I wanted to surprise her with something more fancy (she is always there for me to freak out on when I have a cake drama, after all! ), and it was a good opportunity to make some to photograph and show to other customers. My last minion cake is my favourite (out of these, and it’s up there with my all-time faves, too!) and I actually made in a course at Bake Boss with the one and only Handi from Handi’s Cakes. If you haven’t done a class with Handi I recommend 10/10. He is genuinely the nicest person ever, has a wonderful sense of humour and is, on top of that, incredibly incredibly talented! I also thought the class was really good value, given that we got to take home this amazing sculpted cake worth around the cost of the class, anyway! I managed to sell my cake (for well below RRP, but still, better than nothing!) online, last minute, to a family who were celebrating their mother’s 70th! 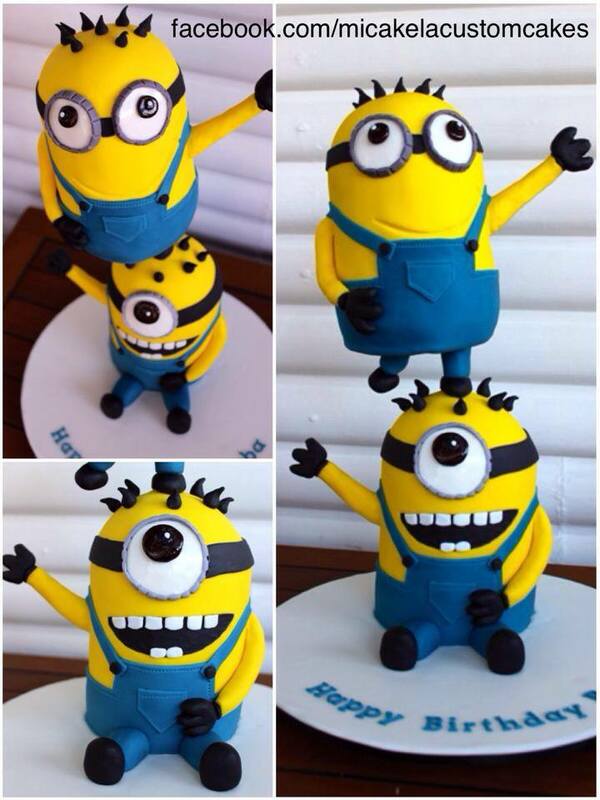 Note to future offspring: I too would like a balancing minion cake for my 70th. It was nice to know it was going to good use. They had little kids in the family and I wouldn’t be surprised if they loved the cake more than grandma did! I am really excited to announce I’ll be teaching the minion cupcakes above at St George and Sutherland Shire Community College early next year (along with some other classes! ), so you can make your own! I’ll post more details on my Facebook page when the details are formally published on the college website – so if you’re a local and have some kids you’d like to palm off to someone else for a few hours… keep your eyes peeled!